From left, AmLit editors-in-chief Morgan Jordan and Kaitie O'Hare with The Eagle editor-in-chief Lindsey Anderson. Photo by Eric Hian-Cheong, The Talon. 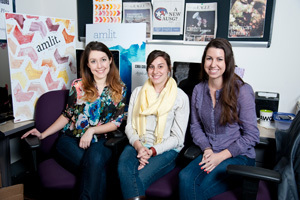 It’s been a good year for AU’s student media organizations. From renovation of the WVAU radio station to the appointment of experienced journalist Adell Crowe as coordinator for student media and communication, groups like ATV and the campus newspaper The Eagle saw major improvements that garnered off-campus honors. Morgan Jordan and Kaitie O’Hare spent the past year as editors-in-chief of the student literary magazine American Literary – or AmLit. The pair’s efforts earned the literary journal second place in the nation at the 2012 College Media Advisers awards this spring. While AU educates wonks of all walks, the award may come as a surprise for an institution best known for its Schools of Public Affairs and International Service. AmLit pulled many of its 600 creative writing and visual arts submissions this year from those students in creative majors, yet Jordan believes the magazine’s success and quality material has been a campus-wide effort. AmLit, however, wasn’t the only AU student media group attracting honors this year. The Eagle also earned regional recognition, winning college-level Mark of Excellence Awards from the Society of Professional Journalists. Editor-in-Chief Lindsey Anderson says the handful of awards, spanning first place in feature writing to third place for breaking news photography, owe much to the paper’s coverage of the tenth anniversary events commemorating 9/11, vigils, and historical investigations. The first-place finish for The Eagle will push the weekly publication into the running for a national Mark of Excellence Award this June. Anderson, a graduating School of Communication senior, worked tirelessly over the past year to improve the paper, increasing content from an average of 12 pages to 24 and instituting a 24-hour policy on posting time-sensitive pieces to The Eagle’s website. She hopes the changes will continue after her tenure and emphasize varied ways of conveying news to students. Aside from receiving recognition for their hard work and achievements, members of AU’s student media groups gain valuable experience in their respective fields. With The Eagle, staff writers interviewed top politicians like John Huntsman, while Anderson – who was involved with the paper from her freshman year – learned about working as a journalist, from writing features to serving in the top spot of an award-winning publication. Even AU alum and NBC’s Meet the Press host David Gregory credits his time as a WVAU DJ as a formative experience of his career. Jordan, an SOC graduating senior who co-managed 35 AmLit staff members, will carry confidence from her literary journal’s success into the working world, where she looks to pursue a career in fashion publications. So, while the awards certainly deserve note, perhaps the most valuable thing these media wonks have received is the experience they can take into the professional market after graduation. Hear about more honors for The Eagle here.